It doesn’t seem like that long ago when I was a student at St. John Neumann Catholic School in Lilburn, being shuffled in for a schoolwide Mass. All eight grades just barely fit into the sanctuary, even spilling into the choir area for the extra space. Throughout my time growing up the Stone Mountain/Lilburn area, I encountered the SJN community on a regular basis, whether it was playing guitar in the Life Teen music group or joining the casual softball league with some buddies of mine. The crucifix in the new St. John Neumann sanctuary. Photo compliments of Anthony R. Socci Photo & Graphic Design. 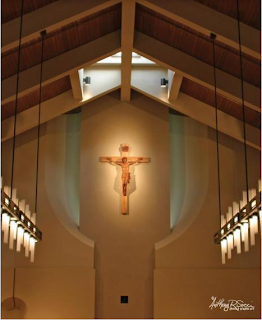 Tomorrow I will return to SJN for the Mass to dedicate its new church building. Most of you know about the struggles the school and church community endured after severe flooding damaged a good portion of the facilities last year. However, construction on the new building continued shortly afterward, with the spirits of the parishioners hardly dampened. Tomorrow they will all come together to celebrate their new worship space, and one that is well deserved. I am very excited to be able to attend this important moment for the SJN community and encourage all of you to look for the article on the Mass and dedication in the upcoming issue of The Georgia Bulletin!